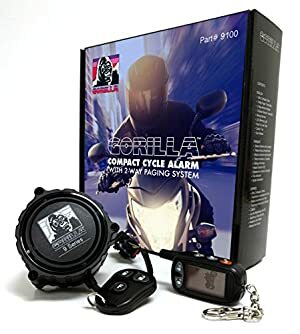 8 Best Motorcycle Alarm Systems Reviews & Bike Alarms in 2019! If you are a proud owner of a motorcycle, you know how important it is to protect your vehicle. There are lots of risks when it comes to leaving your property outside. Motorbikes are quite easy to steal if they are not secured. There are several prevention measures you can take. But the most important thing here is to lock it well, so installing the right gadget is critical. 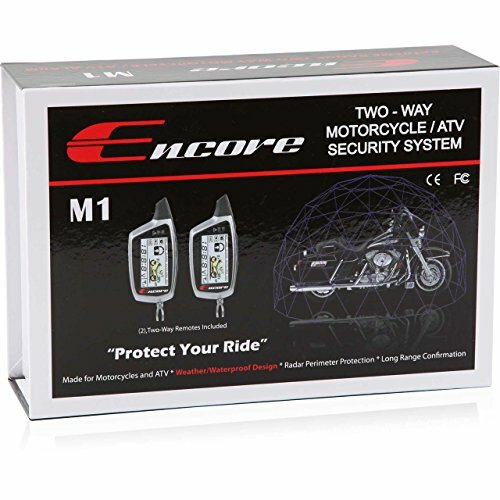 I guess you’re looking for the best motorcycle alarm system ensured by the best motorcycle security. They are all high-technology and quality items to provide the utmost protection. I’ve reviewed all of them to help you choose the most suitable device. Depending on the motorcycle you own and the features you are looking for, you might be interested in different items. Some of them provide multifunctional controllers and remote adjustments. Others are quite simple, but they can receive warning signals from a long distance. When picking a security gadget, please make sure that the kit contains everything you need. It is always better to save time and money and get items all together – the lock, remotes, wires, etc. Please keep in mind that some items do not include batteries, so you’ll have to buy them separately. There are three main ways the locking system warns you as well as the people around about the incident. Most sensors detect motion and vibration. Some of them are capable of notifying you immediately that someone is really close to the vehicle. Others warn you about the bike being moved. Another alerting signal is the siren. They are usually up to 120 dB and provide a loud alarm. 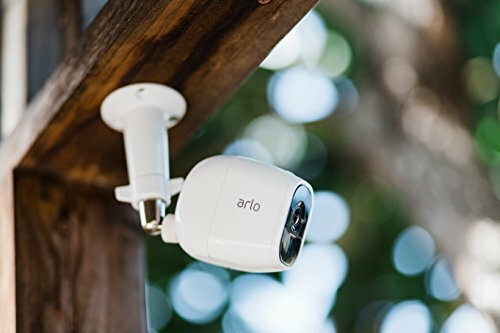 Some of the devices possess a silent mode, which might be a good option if you want to increase the sensor’s sensibility but not to wake the whole neighborhood up because of the wind-induced vibration. The third way to protect your bike is a visual warning system. You won’t believe it, but it is represented by an ordinary flashing light! Firstly, it might scare the theft away. Secondly, it shows you that the lock is working. Useful stuff, isn’t it? Some manufacturers provide special functions, such as an increased transmitting distance or extra control options. There are items on my list that allow turning the engine remotely on or off. There is also a possibility to set the timer for the engine. There are hands-free locks which you can turn on automatically to make your user experience comfortable and effortless. Another important feature you need to consider is the resistance to different influences. The locks are mostly used outside, and the environment can be pretty unpredictable. It is always better to invest in something that will serve you for a long time. It is an incredibly secure item as it features several innovative technologies. Firstly, I should mention the powerful sound-alarming system – it goes off on 120 dB, so you’ll hear it from a large distance. There are three sensors for the complete integrated protection. They are extremely sensitive to various types of attacks. One of them has been designed to react to the bike being moved; it is a tilt sensor. It responds to the smallest change of an angle. The shock sensor is also excellent as it has 7 levels of sensitivity that you can modify – this is a fantastic feature! And the third sensor is responsible for notifying you about the battery level and alarming when someone is riding the bike. You will also receive an alerting message if your bike is being attacked. There is a pager capable of getting a message from half a mile away. The pager has the screen for additional information – it shows not only the alert but also which sensor was triggered. There is another fascinating feature – LED light. First of all, it is useful because it indicates that the system is working. You can be sure that everything is okay, the motorbike is powered and secured. LED light also makes it visible to a potential attacker who might not want to take the risk of stealing it. The installation of the whole system is remarkably fast and simple; it will take you no more than 30 minutes. And you don’t have to buy any extra tools for it! The kit contains Gorilla automotive 9100 motorcycle alarm and all the necessary wires and equipment. There is a pager, an antenna, a remote button transmitter, and LED light. The user manual is clear and helps to attach and adjust the item with little effort. There is a super loud siren and 3 different sensor types providing signals to your receiver, and the visual flashing light. This item is quite light; you can take it with you everywhere you go. It is easy to adjust and settle. Another advantage is the water-resistant feature. If you’re looking for something innovative – this product will be just right for you. Let’s start with the monitoring distance. It is almost unbelievably good – the signal reaches the monitor over 3500 meters! That means you don’t have to be near your motorbike all the time. Another remarkable feature of this product is the ability to start the engine remotely. It is super convenient – you can turn the engine on when you are on your way to the motorcycle, and it will be ready for your arrival. What is more, you can even set a timer on! The manufacturer provides two remote controllers, so you can share it with a family member if both of you are using the motorcycle. How will you benefit from this product? Firstly, it is equipped with a shock sensor that alarms you. There is a feature that helps to remotely set up and adjust the alarm and find the vehicle. The pager has a screen to provide all the necessary information. It also has a clock and four buttons. You can disarm the product from the remote controller. Please note that the warranty requires the professional installation of this device. The product comes with the wires needed for attachment, sirens, sensors, two motorcycle alarm pagers, and the batteries. The system contains shock sensor, sound signal, and visual signal. It is a three-in-one complete protective system that is remarkably good. The siren is 120 dB. The thing I consider most fascinating is the distance the remote controller can receive the signal on. The item is multifunctional, and you can turn on the engine, disarm the security system, and adjust the features remotely. The sensitivity can be changed. 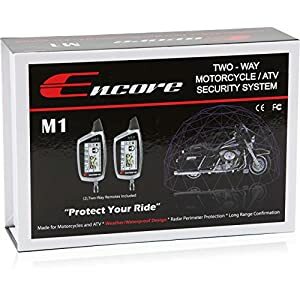 This product is universal, as it is compatible with numerous motorcycles and scooters. You can install it on almost any DC12V bike represented on the market, which is so convenient. It is also remarkably durable and trustworthy, that’s why it is the best motorcycle lock of 2018. The security system consists of the sensors, sound signal, and remote control. There are two types of sensors – the shock ones and the motion ones. This combination allows preventing serious, significant attacks. You will be immediately warned about any kind of activity taking place near your vehicle. The remote controller also has an engine starting feature. It is up to you whether to use it or not. It has little to do with the protection, but it is very convenient in terms of vehicle usage. Please consider that this feature requires an extra battery. The remotes have 4 side buttons for various adjustments and controls. They are also equipped with the screens to show the updates and the most relevant data, such as time and battery charge. The product is accompanied by a signal siren, wires, two remotes and all the necessary hardware. It is recommended to ask the manufacturer to install the lock professionally, although the instructions are also quite user-friendly. Please note that the batteries for remotes are not included in the package and should be bought separately. The protection system has two different sensors, the remotes and a sound signal. The remotes allow arming or disarming the system at a distance. There is also a panic button and a visual indicator. This item is compatible with lots of motorbike models, which is so handy. It gives you the possibility to turn the engine remotely. The sound siren can be disarmed and put on a silent mode so that you will get the notifications, but there will be no loud sound. It can also be paused after it has gone off. This is another trustworthy item on my list. The programming and the construction of this system make it one of the best items on the market. There is an installed battery that backs up the whole system. If the wires are cut or damaged, there is a backup powering to the locking construction. It is a fantastic advantage! You can also turn the system on and off at a distance. The lock will send you a message if it detects any motion. The whole construction is quite small, which means that you can transport it without any effort. The siren is loud – it is 120 dB. The lock, the wires, a remote controller with a LED screen. All the necessary instructions are provided. The installation is simple. There are sensors, a siren, and GPS security features. They are combined to create the maximum protection for your vehicle. The motion sensor alerts you as soon as someone gets too close to your property. It is incredibly sensitive, so the thieves won’t have any chance! This is a hands-free product that requires no unwanted motions. The alarm automatically turns on and off, so you don’t have to switch it manually. Another specific feature of this product is that you can attach it directly to the motorbike’s battery if it is 12 volts. So you don’t have to worry about the batteries running out. The battery saving is ensured by the sleep mode that is also automatic. It won’t drain the charge if there’s no need for it. There is a possibility to program multiple remotes to control the locking system. It is a great advantage for those who share a vehicle. Moreover, this is probably the best motorcycle alarm system with GPS. This product stands out from the crowd of the competitor items thanks to the remarkably lasting and reliable materials. The construction has been made of the stainless steel, so it is resistant to harsh environmental influences. The lock is rust-resistant and works even under the rain. It is a huge advantage as you can use it under any outdoor circumstances. Don’t worry, the product provides the long-term service. Double locking ensures an increased protection level. It is reinforced and resistant to various attacks. The sensor tracks all the activity and motion to warn you if anything is happening to your property. The sound signal is sturdy and goes off automatically when the vibration is detected; it reaches 110 dB. Another thing worth mentioning is the lock reminder cable. You can lock it when you leave your motorcycle. It has been designed to visually protect it and remind you to take the lock away when you are back. It also prevents harming of the lock if it is left attached during the movement. 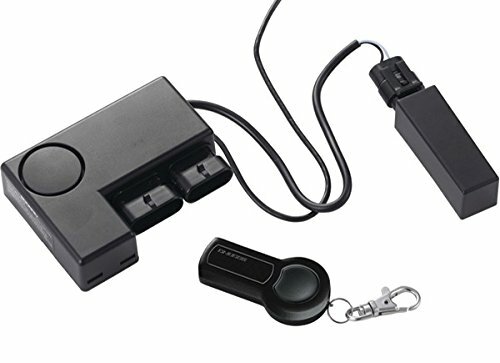 The product goes together with the remarkably powerful batteries for the remote control and the lock. There is also an extra battery set provided. The item comes with the required parts and the hardware. The installation is simple and requires no professional help. The package includes the disc lock, small wrench to change the batteries, the keys for lock, the batteries and the reminder cable. There is an exciting feature of the sound alert system – it goes for 3 short beeps when the vibration is detected for the first time. If the vehicle keeps on trembling, the alarm goes off and stays on for a long time. This is excellent because it can scare away the thief and also prevent the accidental turn-off caused by the wind. This product can be used with a great variety of motorbike models, scooters, cruisers, choppers and sports bikes. It is a multifunctional protection system. The item is solid, so it is resistant to the unpredictable weather conditions. The system will notify you with a sound when the batteries need to be replaced. There will also be a beeping sound when the lock is turned on and set up correctly to let you know everything is right. I suppose it’s the best scooter alarm system on the market. This product is equipped with three different sensors. 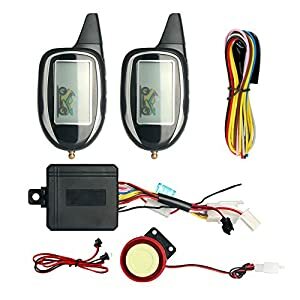 There is a shock and tilt sensor, they both are responsible for warning you about any vibration, movement or hitting of your vehicle. The third sensor is for ignition, which is a rare but useful function. This item is also advantageous as you can use it hands-free. Locking can be automatic or manual; it is up to you what option to set up. RFID allows using the device without excess efforts. The transceiver is waterproof, which is nice as it won’t be affected by the wet conditions or even rain. It features only one button for the utmost control of the system. It is designed to make your life easier. The package includes the lock, the ports, and the RFID sensor. The construction is simple and functional. There are three types of sensors that protect your motorcycle from physical damage and movement, and one sensor to warn about inflammation. There is also a sound signal and flashing light for visual protection. The batteries are programmed to go into a sleep mode when the lock isn’t used to prevent the discharge. It saves lots of time and power. There is also a backup powering system that works even if the cables are cut or damaged – the siren will go off anyway. 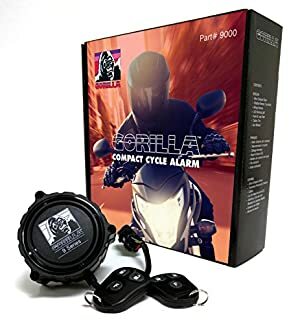 This is another excellent Gorilla automotive 9 series alarm lock that is designed to meet all the needs. It is stable, made of the lasting materials and features all the advantageous functions. It is tiny and easy to transport anywhere. The sound signal is powerful; it reaches 120 dB to provide the maximum alarming capability. There are three sensors for the ultimate warning ability. The shock sensor is adjustable regarding the sensibility. This is an essential feature as you don’t want your alarm to go off when the wind is too strong. The visual protective component is ensured by the flashing light. It is made to keep the attackers away and to show you that everything is working. As well as other Gorilla products, this one is user-friendly regarding the attachment capability. You don’t need professional help or special tools to install the system on your vehicle. The system recognizes you and turns the lock off as soon as you reach the vehicle. This is a remarkable and useful function. The manufacturer provides you with the siren, two transmitters that have no screens, but possess three buttons. All the cables are also provided as well as the light. There are easy-to-understand installation instructions, too. The warning system consists of the three protective components – sensors, siren, and flashing light. There are also two transmitters that allow you to control the system remotely. They also warn you if something is going on. The tilt sensor is adjustable; it has 7 levels of sensitivity. The installation is easy and user-friendly, which is a great advantage. The system is programmed to warn you when the battery is too low, so you can change it on time. The remote keys can remember up to three security codes. There are two of them in the package so you can have a backup at home. If you are searching for a long-distance protection, this item definitely meets your requirement. Two remote transmitters are designed to receive the signal at a large distance. They feature four buttons for the control of the whole system right from your pocket. They are also equipped with the screens that show you all the recent information and messages from the lock. The lock has a built-in radar sensor which is known for its wonderful protective capabilities. It covers the perimeter around your vehicle to detect any movement and undesirable vibration. It can be turned off remotely. It is important to mention that the whole construction is waterproof and can be used even under the heavy rain – it won’t affect the lock. There is a lock, wires, and two receivers. All the necessary hardware is included, and the installation is pretty simple. The construction is lightweight, so it’s no problem taking it with you anywhere. There are sensors, a visual component and the sound warning. The main advantage of this lock is that the radar sensor protects the perimeter and the transition of the signal, so a message from a long distance can be received. The system has a silent mode so you can turn the siren off. The construction is waterproof and extremely durable. The lock has a low-battery consumption function. Motorcycles are very convenient vehicles especially in the cities. Their flexibility and mobility save you lots of time. What is more, they are very cool! So it is no surprise that they are widely accessible. But there is a dark side of their popularity – unfortunately, they get wildly stolen, too! It is a necessity to secure your vehicle with a perfect locking system. 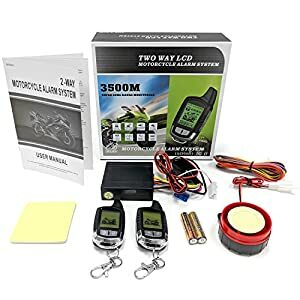 I hope that this best motorcycle alarm system review helped you to pick an excellent product. Please note that there are some features you might be interested in, such as portability, stability, and liability. The radius of the signal is critical as well. The battery charge should be monitored by the system, so that you remember to change them appropriately. It is also good to have a remote control and a possibility to adjust the system at a distance. You might be also interested in having 2 control devices, for instance, if you share the vehicle or want to have a backup item at home. Please let me know which lock you liked most and which one you decided to buy. Is there any wiring diagram to connect an alarm so it will only start in neutral? 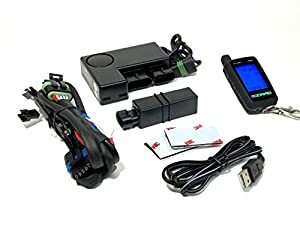 With any remote start device, there will be a wire that will connect to your negative wire to your neutral safety switch wire. This can easily be found in your SERVICE Manual, not Owner’s Manual. Some bikes will require an extra connection or two like say… a Suzuki GSX-R, which requires the clutch to be pulled while you press the starter button. 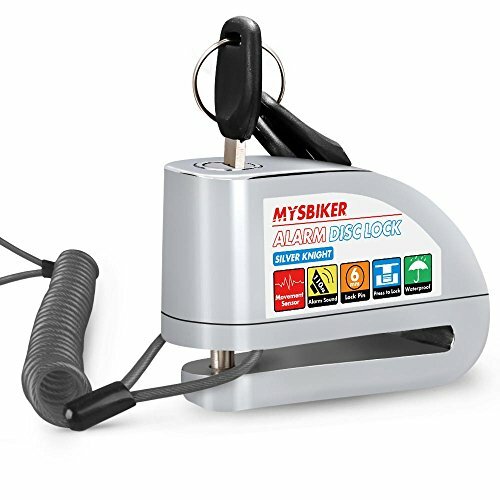 I’m sure this would be covered in the alarm/remote start manual, if not, consult with your bike’s message board for your answer, wiring help, best way to hide, protect, make thieves take as long as possible to get to the alarm so you’ll have ample time to grab your Sig Sauer P226 .40 Cal. Or at least that’s what I do & have done. God Bless Texas. Your vehicle is considered exactly the same as your home, therefor Stand Your Ground Law allows lethal action. That is if you’re occupying the car/truck/bike at the time of the robbery, but hey, unless there’s nearby security cameras or witnesses, your story vs his. Any remote start will have this wire & will require them to be either NC or NO (Normally Closed or Normally Open) & positive or negative trigger (usually negative,) in order to start, just like an aftermarket Navigation/DVD/Multimedia Screen be connected to the negative wire of the parking brake in order to play DVD’s, access features, settings, etc… which is easily defeated by connecting the correct resistor that, that particular radio brand (sometimes gets changed up by model) requires to trigger the false parking brake negative signal. It’s the same with car alarms with a remote start just like my yet to be installed top of the line DEI Viper V5906 2-Way OLED LCD Pager Alarm. For manual transmissions, a wire must be connected to the emergency brake & neutral signal trigger usually that goes to the dash instrument gauge. For Automatics, it needs to be connected to the sensor for “Park.” Otherwise, the Viper will not initiate the remote starting procedure. A 1 Way alarm is useless. Two-way alarm with at least a tilt sensor and if it doesn’t come with it, add a battery backup mini piezo siren. Depending on your area & if it’s a sportbike, consider adding a reputable live tracking cellular 3G or GPS Tracker. If you’rein a big city, & own a sportbike, chillin’ at the Taco Bell eating, all it takes is a cargo van, a driver and two guys to stop at your bike, jump out, grab it, throw it in the van & they’re gone before you notice. The GPS needs to be small, again… VERY reputable, easy to conceal, have it professionally installed or if you have the skills, run the wiring (power, ground, antenna, etc…) run with the factory wiring harness, using wires that blend in, twist with the harness, preferably sliding in the middle concealed in the wire looms wherever it goes & make sure it has a good long battery life. Thieves aren’t stealing to resell it. They’re stealing it to immediately tear it down at a chop shop & sell it for parts, so sooner law enforcement gets there, the better your chances are before they find the GPS Unit & smash it/toss it on a fake vehicle. Sportbikes, actually SuperSports to be exact, are the most stolen genre of motor vehicles, hence why comprehensive coverage is stupid high on insurance, close to Collision, which on 4 wheeled vehicles (cars, pickups…) the difference is pretty significant. It’s because of how many 420-450lb SuperSport 600’s, 750’s, literbikes, Busa’s/ZX-14R are stolen & how easy it is to steal, conceal, strip & sell. Don’t have to get LowJack, but they’re cheaper options (a good one will require a SIM Card for 3G/GSM Cellular Data Service which is just like a cell phone plan, monthly cost, but most have options to be billed quarterly, 6 months, yearly, etc.. usually around $5-$10 months or $50-$100 a year. Or the service is via GPS Satellite. Research before you buy. Goodluck.